Hosted by University of Alaska Fairbanks Northwest Campus. For more information e-mail Claudia Ihl or call (907) 443-8417. The first conference of this type, held in April 2008 in Dillingham, Alaska, brought together 120 scientists, educators, rural leaders, and subsistence hunters and gatherers to discuss science and issues relevant to western Alaska. The conference will highlight regional scientific efforts and traditional knowledge that provide an interdisciplinary approach to scientific inquiry and resource management. In addition to scientific sessions, the conference will include several workshops addressing topics relevant to life in rural western Alaska. Organizers welcome submissions from all individuals and organizations collecting data in western Alaska. Thursday, April 9, 6–9 p.m.
WAISC Banquet with Eskimo Dancing and Keynote Address by George Noongwook, Savoonga Whaling Captain at the Mini Convention Center. Abstracts for oral and poster presentations or workshops are invited and should be submitted before March 1, 2009. For full details, view the 2nd call for papers. 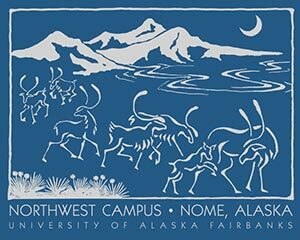 Beautiful UAF Northwest Campus shirts sporting this design will be available for only $15. Get yours at the conference!